Beside the well there was a ruin of an old stone wall. When I came back from my work the next evening, I saw the little prince from some distance. He was sitting on top of the wall. His legs were hanging in the air. He was talking to someone. I continued my walk toward the wall. I still couldn’t see or hear anyone. However, the little prince replied again, “Sure. You will see where my footprints begin in the sand. You just have to follow me to that place. I’ll be there tonight. I’ll be waiting for you. I stopped. My heart was beating strongly, but I still didn’t understand. 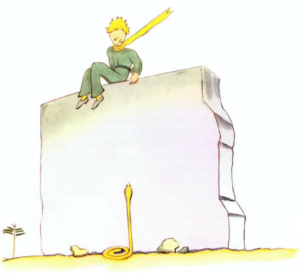 “Now go away,” said the little prince. “I want to get down from the wall”. Then I looked down at the bottom of the wall, and I was shocked. There was one of those yellow snakes that can kill you in thirty seconds. I was going to take my revolver out, but when I was trying to reach it, I also made a step back. The snake heard it. He started to move and quickly disappeared among the stones. I still heard him but he was no longer visible. I reached the wall just in time to catch my little prince in my arms. His face was as white as snow. He looked at me. His eyes were sad. He put his arms around my neck. I felt his heart beating like the heart of a dying bird, shot with some gun. I was just coming to tell him that my work was successful.